This article is about the ancient Maya site. 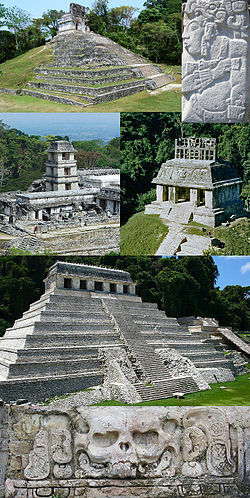 For other meanings of "Palenque", see Palenque (disambiguation). Palenque (Spanish pronunciation: [pa'leŋke]; Yucatec Maya: Bàakʼ /ɓàːkʼ/), also anciently known as Lakamha (literally: "Big Water"), was a Maya city state in southern Mexico that flourished in the 7th century. The Palenque ruins date from ca. 226 BC to ca. AD 799. After its decline, it was absorbed into the jungle of cedar, mahogany, and sapodilla trees, but has since been excavated and restored. It is located near the Usumacinta River in the Mexican state of Chiapas, about 130 km (81 mi) south of Ciudad del Carmen, 150 m (164 yd) above sea level. It averages a humid 26 °C (79 °F) with roughly 2160 mm (85 in) of rain a year. Palenque is a medium-sized site, smaller than Tikal, Chichen Itza, or Copán, but it contains some of the finest architecture, sculpture, roof comb and bas-relief carvings that the Mayas produced. Much of the history of Palenque has been reconstructed from reading the hieroglyphic inscriptions on the many monuments; historians now have a long sequence of the ruling dynasty of Palenque in the 5th century and extensive knowledge of the city-state's rivalry with other states such as Calakmul and Toniná. The most famous ruler of Palenque was K'inich Janaab Pakal, or Pacal the Great, whose tomb has been found and excavated in the Temple of the Inscriptions. By 2005, the discovered area covered up to 2.5 km² (1 sq mi), but it is estimated that less than 10% of the total area of the city is explored, leaving more than a thousand structures still covered by jungle. Palenque received 920,470 visitors in 2017. Mythological beings using a variety of emblem glyphs in their titles suggests a complex early history. For instance, K'uk' B'ahlam, the supposed founder of the Palenque dynasty, is called a Toktan Ajaw in the text of the Temple of the Foliated Cross. The famous structures that we know today probably represent a rebuilding effort in response to the attacks by the city of Calakmul and its client states in 599 and 611. One of the main figures responsible for rebuilding Palenque and for a renaissance in the city's art and architecture is also one of the best-known Maya Ajaw, K'inich Janaab' Pakal (Pacal the Great), who ruled from 615 to 683. He is known through his funerary monument, dubbed the Temple of Inscriptions, after the lengthy text preserved in the temple's superstructure. At the time Alberto Ruz Lhuillier excavated Pakal's tomb, it was the richest and best preserved of any scientifically excavated burial then known from the ancient Americas. It held this position until the discovery of the rich Moche burials at Sipan, Peru and the recent discoveries at Copan and Calakmul. Beside the attention that K'inich Janaab' Pakal's tomb brought to Palenque, the city is historically significant for its extensive hieroglyphic corpus composed during the reigns of Janaab' Pakal, his son K'inich Kan B'ahlam, and his grandson K'inich Akal Mo' Naab', and for being the location where Heinrich Berlin and later Linda Schele and Peter Mathews outlined the first dynastic list for any Maya city. The work of Tatiana Proskouriakoff as well as that of Berlin, Schele, Mathews, and others, initiated the intense historical investigations that characterized much of the scholarship on the ancient Maya from the 1960s to the present. The extensive iconography and textual corpus has also allowed for study of Classic period Maya mythology and ritual practice. The Palace as seen from the courtyard. Mask of the Red Queen from the tomb found in Temple XIII. Jade mask of King K'inich Janaab Pakal. National Museum of Anthropology and History, Mexico City. K'inich K'an B'alam II ("Chan Bahlam II"). ^ a b c Schrom, Michael. "Palenque". Archived from the original on January 1, 2004. Retrieved March 3, 2011. ^ Martin & Grube 2008, pp. 155-176. ^ Skidmore 2010, pp. 2-91. ^ Snow, Dean R (2010). Archaeology in North America. Prentice Hall. pp. 165–166. ^ The direction of the K'inich Janaab' Pakal's movement between realms has been the subject of debate in recent years. Initially, Linda Schele, David Freidel, and others saw Pakal as descending into the underworld (Schele and Mathews 1998: 115). More recently, David Stuart and Freidel have suggested the opposite based on glyphic texts accompanying similar scenes. In these images the birth glyph (often spelled SIH-ya-ja) describes the depicted event. Guenter, Stanley (n.d.). "The Tomb of K'inich Janaab Pakal: The Temple of the Inscriptions at Palenque" (PDF). Mesoweb Articles. Mesoweb. Retrieved 2008-02-04. Mesoweb. "Muwaan Mat". Mesoweb Encyclopedia. Retrieved 29 April 2009. Ringle, William M.; Thomas C. Smith-Stark (1996). A Concordance to the Inscriptions of Palenque, Chiapas, Mexico. MARI Publications, no. 62. New Orleans, Louisiana: Middle American Research Institute, Tulane University. ISBN 0-939238-93-4. OCLC 25630088. Schele, Linda; David Freidel (1990). A Forest of Kings: The Untold Story of the Ancient Maya. New York: William Morrow. ISBN 0-688-07456-1. OCLC 21295769. Wikisource has the text of the 1911 Encyclopædia Britannica article Palenque. Wikivoyage has a travel guide for Palenque.